Since MM 0.5 at least, ModemManager comes with a Location interface which is defined to expose not only 3GPP-specific location information (operator MMC/MNC + Location area code + Cell ID), but also GPS-specific location information (cached NMEA traces and raw location information). In MM 0.7, this Location interface will actually work for GPS location, at least for Option modems with GPS capabilities. The High-Speed Option plugin is probably one of the most complex plugins being handled in ModemManager. In the new ModemManager 0.7 codebase, HSO modems (MMBroadbandModemHso) are implemented as a subclass of the standard Option modems (MMBroadbandModemOption), as they share lots of common features (allowed modes management, access technology and signal quality reporting…); but they also implement lots of connection related HSO-specific features (e.g. success of a connection establishment gets notified via unsolicited messages), which are most of them handled in a new HSO-specific bearer. Some of these advanced Option modems come with additional surprises: GPS-specific ports (AT port for control, raw serial port for NMEA traces). The HSO modems provide detailed information about the type of each port being exposed in the USB interface; and so during the probing phase we are able to easily grab the GPS-control AT port and the additional serial port for NMEA traces (handled by a new MMGpsSerialPort port type). Once the HSO modem knows it has these two ports, it will allow to enable or disable any of the two GPS-specific location sources (NMEA or raw), or both at the same time. The NMEA location source will enable the modem to expose the last cached NMEA traces; while the raw location source will tell the modem to just expose generic location information such as time, latitude, longitude and altitude. In the case of the HSO modem (and possibly in every other case), both location sources are actually implemented based on the same NMEA traces received (raw information is parsed from $GTGGA traces). In addition to the core GPS location handling and the HSO-specific implementation, libmm-glib and mmcli where also improved to easily play with the new features. Note that ModemManager will expose only the last received NMEA traces of each kind, except for those ($GPGSV here) that are actually building a sequence. Well, if the modem exposes GPS-specific ports in the same USB interface, it shouldn’t be difficult to add support for them, specially now that all the core/libmm-glib/mmcli work is already available. A special case is when the modem exposes a single AT port via USB and the GPS port via RS232 (e.g. Sierra Wireless FXT009 with GPS extension). This case is a bit more tricky as there is no easy way for ModemManager to tell that the RS232 port is to be managed by the same modem object created after grabbing the AT port. In this case, the user may need to explicitly set some magic udev tags to let ModemManager handle the needed logic, but that also may get tricky if the user has more than one such modem plugged in (not sure for what, but anyway). The Planetary Virtual Observatory and Laboratory (PVOL) is an online database of amateur images of the outer planets (Jupiter, Saturn, Uranus and Neptune). It was developed in early September 2004, during my attendance to the first NVO Summer School in Aspen (Co, USA). It was first put online during November 2004, so we already celebrated its 7th birthday. After a bit more than 7 years online, it was time to prepare some charts showing the evolution in the number of images published. 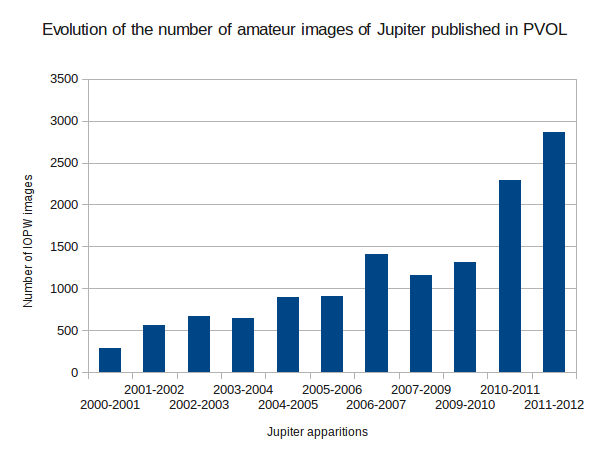 The following graph shows the number of images of Jupiter available since year 2000 (PVOL inherited the images already available in the previous IOPW page). And the 2011-2012 apparition of Jupiter didn’t even finish yet! So, thanks to the growing community of amateur astronomers (260 listed today) publishing images in the PVOL, and special thanks to the Planetary Sciences Group of the UPV-EHU for the great work they’re doing managing the system. Help wanted in ModemManager/NetworkManager development! You’ll get one beer for free if we ever meet. You’ll get two beers for free if we ever meet. This already leaves out Jose, Luca and Alfred. You’ll get three! beers for free if we ever meet.